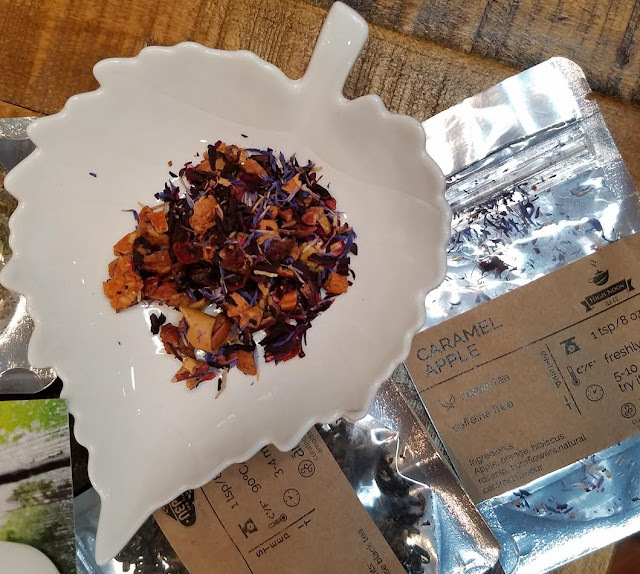 High Noon Tea Co. Caramel Apple- An herbal blend made with apple, orange, hibiscus, rosehip, cornflowers and natural caramel flavor. This was my favorite blend of all. It's sadly already gone and I desperately wish I had more. Perfect for summer evenings. 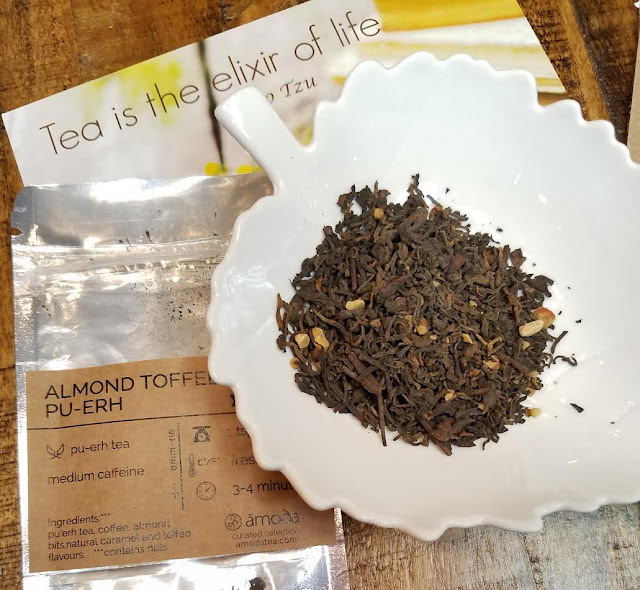 High Noon Tea Co. Almond Toffee Pu-erh- This is a combination of pu'erh tea, coffee, almond bits, natural caramel and toffee flavors. I have to say that when I poured the water over this the toffee-nut scent reminded me of Starbucks. When I tasted it it reminded me of coffee. I thought my brain was going crazy until I re-read the ingredients and realized coffee was on the list. Derp. It's dark like coffee, too. I tasted it, felt it was just too coffee-y and added honey. With the honey added, I could really taste (and not just smell) all those delicious nutty flavors. A perfect dessert drink. All I need is some pound cake. 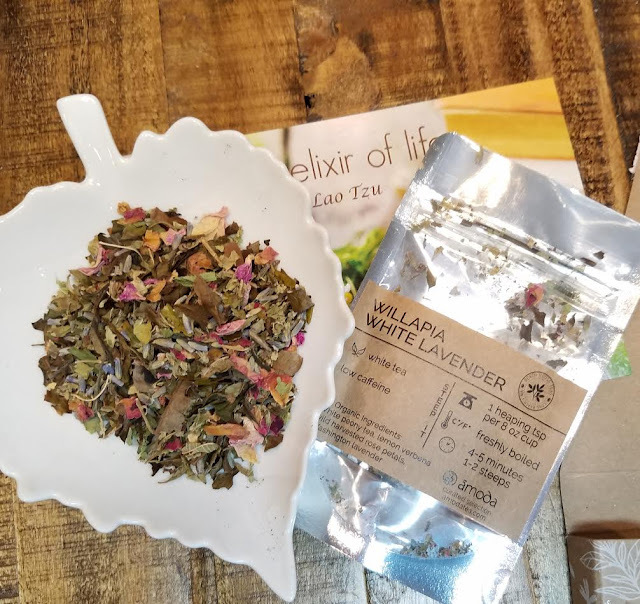 Beach House Teas Willapia White Lavender- This tea is 100% organic loose leaf tea blend of white peony tea with a hint of lemon, smooth Washington lavender and delicate rose petals. This is my least favorite because I'm allergic to lavender. I didn't try it because of that. But I'm sure lavender lovers would rejoice. 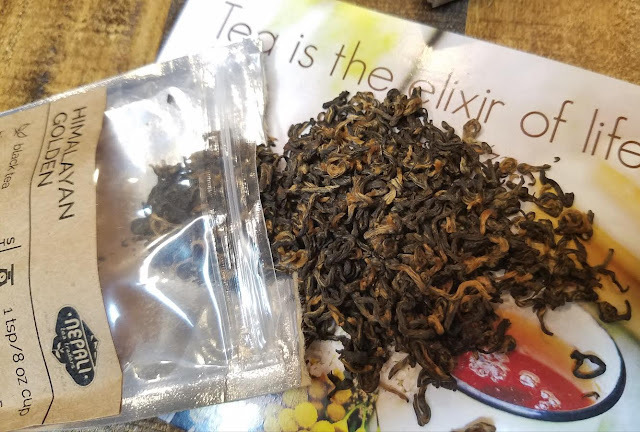 Nepali Tea Traders Himalayan Golden Black Tea- This is a mild black tea with hints of honey and stone fruit. It won a Best Black Tea award in 2015! I'm going to be using this entire packet to make a big batch of iced tea. I think it'll be fantastic over ice with a drizzle of honey and maybe some mint. Mmm! VERDICT: These are fabulous teas and Amoda is an easy way to get new and unusual teas to test. With that being said, it's fairly expensive although as a subscriber, you'll get a free shipping in the shop when you buy more of what you love. I really want more of that Caramel Apple and I'm tempted to snag a bunch more however shipping is a whopping $9 to the US. Although now that I think about it, I bet that's in Canadian dollars. Still. 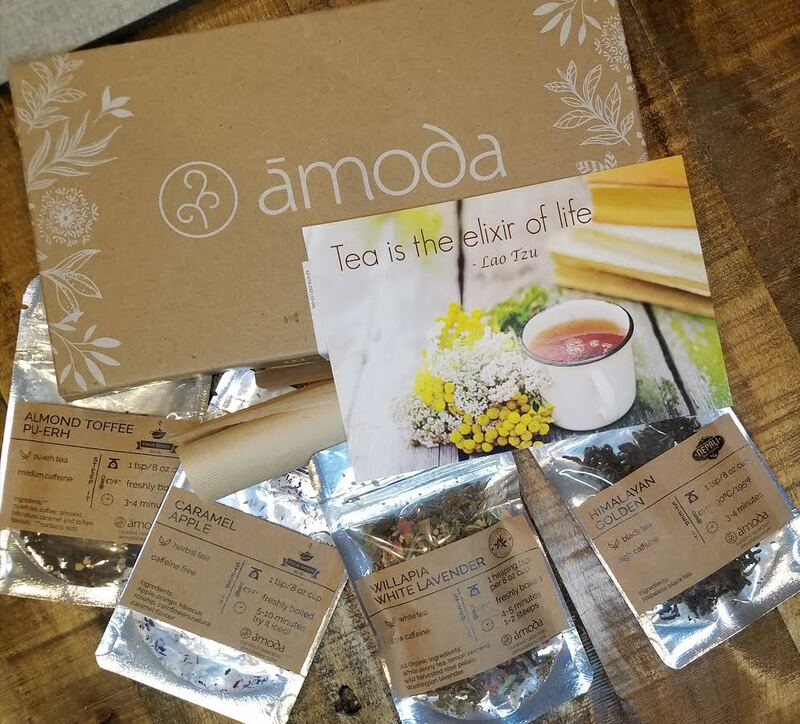 If you would like to sign up for Amoda Tea, you can do that here. Use TAKE5OFF to save $5 off a monthly, 3 month or 6 month subscription.